When teenagers think about what they can do on their own for the sake of world peace, we, as adults, need to support their activities and help turn their ideas into a reality. As well as helping them further their work. While the autonomy of children should be valued, I think one of our duties in modern society is to think together with the children, sometimes worry with them, and grow together with them and build mutual trust. PSJ support the children who took that first step formed TPS. In the future, PSJ Association Inc. will strengthen its cooperation with other organizations and partnered associations, which share the same objectives and address various issues with full force so as to increase the significance of the corporation’s existence. It should be noted that the revenue obtained through the activities of the association will be bestowed as donations upon other charitable organizations and partnered associations. We hope you can comply with the objectives of this organization and we would appreciate your continued support and cooperation. Let’s stick together and be forever. TPS stands for Teenage Peace Seekers. We focus on students who are teenage and live in Japan. We all have different nationalities and birth places. 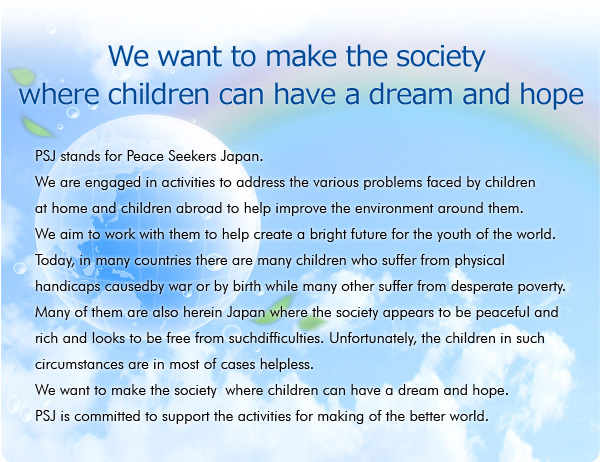 We think about what we can do for the sake of world peace. Our group was established for continuing our activities to make our goal into a reality. We were pre-sale TPS Supporters Mineral Water(Comic Artist “ Leiji Matsumoto ” Edition) , also we did a promotion of the Leiji Matsumoto talk-show help. ©2014 PSJ Association Inc. All Rights Reserved.